Fade to Mind is both a record label and a movement, a series of club nights and cooperative projects in music, visual art, video, and apparel. Kelela Mizanekristos is a Los Angeles-based vocalist and songwriter. Her debut mixtape, Cut 4 Me, is the culmination of a long journey, exploring the space between loss and freedom, and the process of letting go as a catalyst for growth. Concerned equally with confronting hard realities as celebrating romance, with confronting both the ecstatic highs and painful lows of relationships, this deeply personal body of work merges the popular and the unconventional, establishing Kelela’s unique vision for songwriting and production. 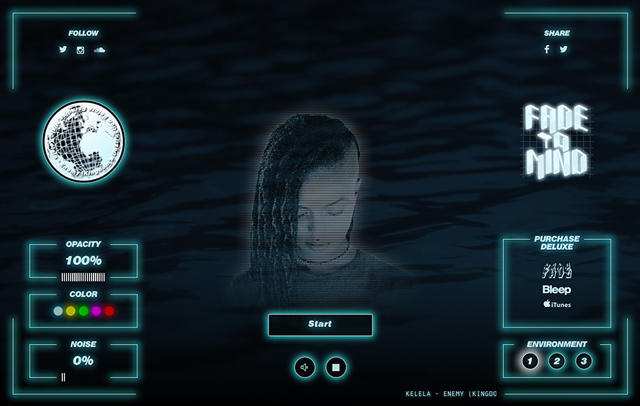 Situated in a universe where pop is necessarily challenging, Kelela’s songs are the result of her passion for the synergy between the vocalist, producer, and DJ. Cut 4 Me is a synthesis of pop and the underground, songs equally at home in the club as in the bedroom. The 14 track mixtape features work from Fade to Mind and Night Slugs artists Bok Bok, Kingdom, Girl Unit, Nguzunguzu, Jam City and Morri$, melding the collective’s signature production with Kelela’s songwriting. You're all up on me now that you're my enemy. There's nothing here to save it's all in front of me. When I'm feeling low, you're not the remedy. I'm keeping to myself, I get the best of me. We keep on letting 'em. But you be holdin tough. And now you want it back I'll keep the best of me now. There's no hate, I couldn't wait. Baby I'll roll pass the blunt.